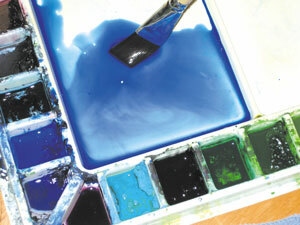 I have just uploaded another tidbit of a lesson from my Beginner's Watercolor Workshop DVD. Visit the link below to learn how to create a graded wash. Sometimes watercolor has a mind of its own, but when you learn what the medium can do it makes it much more fun to experiment with. The graded wash is an application of watercolor pigment on paper which goes from a dark value to a light value (or the opposite). If the wash is not applied correctly you will develop streaks, brush marks and/or blooms. Once you master the four basic washes, you can manipulate them a little better to create the looks you desire in your paintings. I admire your work and ability. I to am from Greenville (class of 62) and hold Mr. Blinn in high regard as my inspiration for pursuing a career in commercial art and now as a painter. I will follow along as you travel through your evolution.